Eating Disorders - body, last, causes, What Are Eating Disorders? Eating disorders are habits or patterns of eating that are out of balance and may involve major health and emotional problenms. Eating disorders are not merely unhealthy eating habits; they involve patterns of eating too little or too much, and they may cause a variety of physical and emotional problems. Eating disorders usually develop during adolescence and usually affect girls, although boys can also be affected. Eating disorders include anorexia (an-o-REK-see-a), bulimia (bull-EE-me-a), binge eating disorder, and obesity (o-BEE-si-tee). Anorexia is an eating disorder that involves fear of becoming or being fat, intensive dieting or exercise, and a distorted body image. People with anorexia see themselves as fat even though they may be dangerously underweight. They severely restrict their food intake and/or exercise to extremes in order to lose weight. Someone may be diagnosed with anorexia if she refuses to eat enough food to maintain a healthy weight, and has lost more than 15 to 20 percent of her healthy weight. For example, a girl with anorexia whose healthy weight is 125 pounds might weigh 105 pounds. She might eat as little as 500 calories a day (most healthy teenagers eat 2,000 or more calories a day). Sometimes referred to as the "binge-purge" disorder, bulimia involves repeated episodes of binge eating (consuming large quantities of food while feeling little control over the behavior) followed by purging (trying to rid the body of the food by vomiting or by using laxatives or enemas). Some people with bulimia also exercise excessively. In bulimia, self-image is overly tied to body shape and weight, and people with this disorder are dissatisfied with these aspects of their body. However, unlike those with anorexia, people with bulimia usually stay at a fairly healthy weight. Binge eating disorder involves out-of-control overeating but lacks the purging that is seen with bulimia. Binge eaters often are obese or constantly dieting and they often feels guilty after a binge. Painful emotions or stress may trigger binges. Obesity is an excess of body fat. People are considered overweight if extra body fat causes them to weigh 20 percent more than the healthy weight for their height and obese if they if they weigh more than 30 percent above what is healthy for their height. Most teenagers are concerned about how they look. After all, their appearance is changing very quickly. Girls are developing breasts and their hips are becoming rounded and curvy. Boys' voices are deepening and body hair is increasing. Most teenagers have an ideal image in their minds about what they should look like, and images on television and in the movies reinforce the goal of thinness as perfection. Many young people, particularly girls, go on diets to control their body weight. Dieting has been reported to start as early as elementary school. Dieting without guidance by a medical doctor can cause problems with growth and development for children and teens. Sometimes an earnest but misguided effort to control weight can evolve into an eating disorder. Consider Diane, a 13-year-old seventh grader. Her diet began innocently enough. She thought she was 10 to 15 pounds overweight and switched her lunch from a sandwich and cookies to a salad. She lost a few pounds. She liked feeling thinner, got a lot of compliments, and pretty soon she reduced the salad at lunch to a carrot and a piece of cheese. Diane trimmed her dinner as well, telling her parents that she had eaten a big lunch and was not hungry. Before long, Diane had lost 20 pounds. But Diane was surprised that she did not feel happy; instead, she was obsessed with food and her weight (she still felt fat) and was embarrassed whenever anyone commented on her body. Diane continued dieting and also began to exercise two times a day to try to lose more weight. Diane is not alone; experts say that more than five million American women and girls and one million men and boys suffer from eating disorders. About 1 in 100 girls between 12 and 18 years old has an eating disorder. As many as 1 in 10 college females has anorexia or bulimia. More than 1,000 young women die each year from the serious medical problems that develop because of eating disorders! Young people who participate in sports that prize thinness are at particularly high risk of developing eating disorders. Female dancers, ice skaters, and gymnasts have a three times greater risk for developing an eating disorder than do girls not involved in such activities. Boys who participate in similar sports or in wrestling are also at higher risk. Girls who enter puberty early and girls who are overweight may also be more likely to develop eating disorders. There is no clear-cut, single cause for any of the eating disorders. Many factors seem to contribute, including influences from society and culture (such as the glorification of thinness by the mass media), emotional issues (such as a teenager's striving for perfection, exposure to intensely stressful situations, and fears of maturity, puberty, or sexuality), family factors (such as overly controlling parents, serious emotional conflicts, or problems expressing feelings), or poor childhood feeding and eating patterns. People who have an eating disorder usually do not set out to deliberately have this problem. Generally, eating disorders develop slowly, as do the signs and symptoms. Eating disorders are serious problems and can cause a variety of medical complications. In anorexia, rapid weight loss can lead to blood chemical imbalances, failure to menstruate * , slow pulse, low blood pressure, and heart problems. In some cases, damage to vital organs is so serious that it can result in death. The frequent vomiting associated with bulimia can cause throat tears or sores, damaged tooth enamel, broken blood vessels in the eyes, and puffy cheeks from swollen salivary glands. With both anorexia and bulimia, bowel and intestinal problems can occur and serious vitamin and mineral deficiencies can cause serious and long-lasting problems. Binge eating often results in obesity, which in turn can lead to other health problems. People who are obese are at greater risk of developing diabetes * , heart disease * , high blood pressure * , osteoarthritis * , and other health problems. Teenagers with anorexia, bulimia, and binge eating disorder often try to hide the problem, so formal diagnosis can be delayed or difficult. Even when caring friends or family members ask about the weight loss or other symptoms, most teenagers with eating disorders are ashamed or embarrassed, especially by the purging that accompanies bulimia. Because of distorted body image, those with anorexia may not be able to recognize the seriousness of their extreme weight loss. Unbearable fear of being fat may cause people with anorexia to resist attempts to help them gain weight. A concerned health professional might ask questions about eating, body image, and exercise. Blood or other laboratory tests can help determine if a person's nutrition is adequate and if general body chemistry is balanced. A careful interview and health history may reveal concerns about body image or distorted opinions about body appearance. * menstruate (MEN-stroo-ate)means to discharge the blood-enriched lining of the uterus. Menstruation occurs normally in females who are physically mature enough to bear children. Because it usually occurs at four-week intervals, it is often called the "monthly period." Most girls have their first period between the age of 9 and 16. * diabetes (dy-a-BEE-teez) is a disorder that reduces the body's ability to control blood sugar. * heart disease is a broad term that covers many conditions that prevent the heart from working properly to pump blood throughout the body. * high blood pressure, or hypertension (hy-per-TEN-shun), is a condition in which the pressure of the blood in the arteries is above normal. Arteries are the blood vessels that carry blood from the heart through the en-tire body. * osteoarthritis (os-tee-o-ar-THRY-tis) is a common disease that involves inflammation and pain in the joints (places where bones meet), especially those in the knees, hips, and lower back of older people. Eating disorders have multiple causes, which may include social and cultural pressures, emotional issues, and family stressors. Chemical imbalances in the brain, shown here in cross-section, may also cause eating disorders. 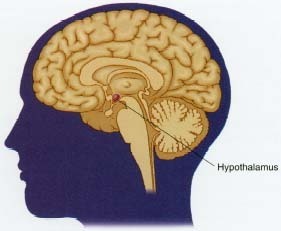 These imbalances affect the hypothalamus, which is believed to control appetite. engaging in other activities that promote over-eating and a sedentary (sitting too much with little exercise) lifestyle. Overcoming eating disorders may take a long time and lots of commitment and hard work. Most teenagers with eating disorders need the assistance of mental health and other health care professionals to manage the problem. Anorexia, bulimia, and binge eating disorder are treated most successfully with a combination of therapies. Behavior change programs, monitoring of diet and eating patterns, individual or group psychotherapy * , support groups, nutritional counseling, family counseling, and sometimes medication may all be part of treatment. People with obesity can be helped by doctor-recommended weight-loss programs that teach healthy habits. To lose weight, people must take in fewer calories * than they use, and the best way to control weight is through exercising and eating a balanced diet. In some cases, doctors may also treat severe obesity by prescribing very low-calorie diets or medications. In rare cases, doctors may advise a surgical procedure that either limits the amount of food the stomach can hold or causes food to by-pass the stomach or part of the intestines. * psychotherapy (sy-ko-THER-a-pea) is the treatment of men-tal and behavioral disorders by support and insight to encourage healthy behavior patterns and personality growth. * calorie (KAL-or-ee) is a unit of energy used to describe both the amount of energy in food and the amount of energy the body uses. Bennett, Cherie. Life in the Fat Lane. New York: Random House, 1999. A novel about the high school experiences of an overweight girl. Folkers, Gladys, and Jeanne Engelmann. Taking Charge of My Mind and Body: A Girls Guide to Outsmarting Alcohol, Drugs, Smoking, and Eating Problems. Minneapolis: Free Spirit Publishing, Inc., 1997. For ages 11-18. Siegel, Michele, Judith Brisman, and Margot Weinshel. Surviving an Eating Disorder: Strategies for Family and Friends. New York: HarperCollins, 1997. U.S. Food and Drug Administration (FDA) posts the fact sheet On the Teen Scene: Eating Disorders Require Medical Attention at its website. The American Psychological Association posts the fact sheet How Therapy Helps Eating Disorders at its website. www.KidsHealth.org , a website sponsored by the Nemours Foundation and the Alfred I. duPont Hospital for Children, Wilmington, DE, posts articles for kids, teens, and parents about eating disorders, obesity, nutrition, and related topics.